EcoloBlue Atmospheric Water Generators(AWG) Will Provide Pure Drinking Water Following a Natural Disaster. Hurricanes, tornadoes, floods and other emergencies can cut off your water supply. 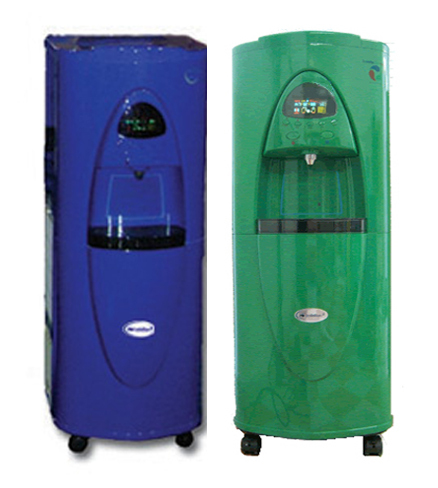 EcoloBlue 28 Atmospheric Water Generators provide pure drinking water from the humidity in the air. This season families now have a new source of water. A person can survive only a short time without safe drinking water. In a natural disaster water can quickly become contaminated and unsafe to drink. Planning for a possible emergency will ensure pure drinking water in a real emergency. 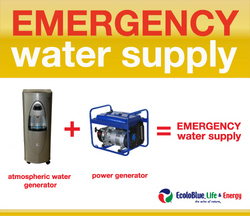 EcoloBlue 28(AWG) and a power generator is an Emergency Water Supply for home or business. Battery packs, wind and solar energy are also options for running Atmospheric Water Generators. Water for cooling off after a storm. EcoloBlue 28 produces up to 7 gallons a day. Stainless tank, biodegradable plastics and a filtration system make water that tests superior. This new source of water provides an insured drinking water supply for Storm Season 2009. Boil water alerts have no impact. Storms named Ana, Bill or Claudette will not interrupt pure drinking water. EcoloBlue Life and Energy assists with family storm survival plans. Consumers in New York, California, Kentucky and Kansas are using EcoloBlue. Emergency Officials are discovering this new source of water.